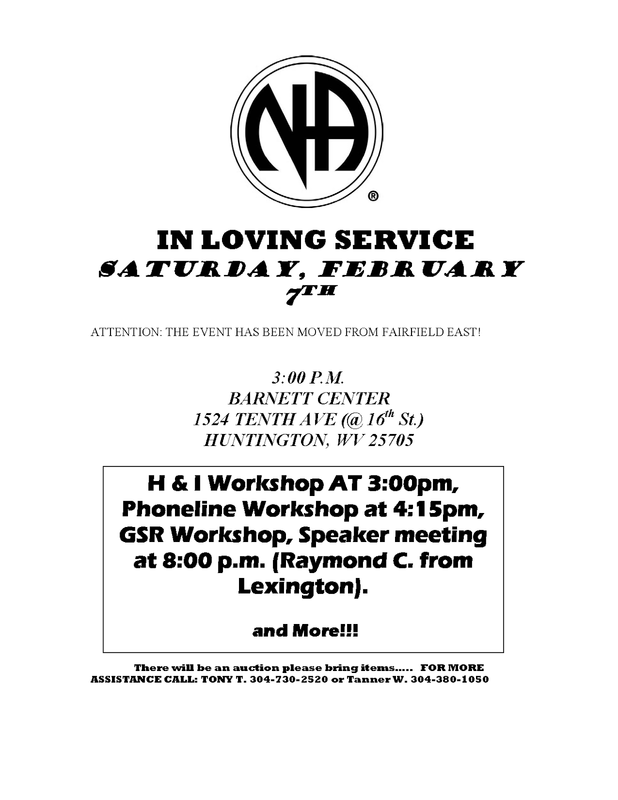 The "Out of the Dark and Into the Light of the Rainbow" meeting, which meets Saturdays at 7pm at 619 6th Ave. in Huntington, will be closed on February 7 to promote area unity due the "In Loving Service" area function that day. webpage for this event as well. available. At one point in time NAWS made an attempt to produce mass copies of the Basic Text in braille. The translation resulted in boxes of pages and was deemed impractical. (I have an email and text conversation that I will include in this report and read at Area Service). I did some searching of my own and have found copies of the Basic Text in braille from other regions literature committees. I don’t know how old these catalogs are so I don’t know if any of them are still available. However, this is the only literature that has been translated during some point in time. There are no It Works: How and Why or Just For Todays in braille. I have been told by our RD that just because this project was abandoned, doesn’t mean that our area shouldn’t purse it further. She also told me that at least two other regions are interested in doing the same thing. Next activities function will be in loving service and we have set that date forFebruary 7, 2015. We discussed having and h&i workshop a phone line workshop. And we will be looking for willingness for speaker that night. Dee Dee G., Carrie G., Tom F., Nate H., Ara S., Rachel N., Tanner W., James C., James H., Dalmas C., Ali S., Chris W., Cassie C., Brian C., Jenni H., Elijah C., Kristen A., Ryan D., Andrew, Sergio, Miles, Nick C.
12 concepts read by Nate H.
12 Traditions read by Ara S.
Happy November and TGIF Subcommittee members! Our Monday night boys' panel at Pressley Ridge is moving along just fine. The clients are receptive to the message and willingness among our members to be of service is high. We are entering and exiting together and on time with the message of hope being clearly conveyed. We are now going in on the 1st and 3rd Mondays of each month. This panel has been a pleasure to lead over the last year - in the spirit of rotation, I look forward to allowing someone else to experience it. In loving service, Nick C.
The meeting is going great. I am taking in the meeting weekly due to Bo V.'s work schedule changing. I do not have his set of readings or format but I do have a copy of my own. Brian C. Will be taking in the meeting for me on November 24th due to a work conflict. The Thursday evening Pinecrest H&I panel is going well. The message is being carried each time we show up. I have not had any trouble putting together a panel at any time. I have noticed a lot of faces from those panels in our outside meetings. It's been a honor to be a panel leader for this particular group. At this time, as it stands, we are in good rapport with Pinecrest and can look forward to ongoing opportunities to carry the NA message there via H&I. All is well at my Pinecrest Thursday night H&I meeting at Pinecrest. The message is being carried. We have had no issues. Grateful to serve, Nate H.
All is well at RP 3 North with the meetings starting and stopping on time and the lifesaving message is being carried. I am grateful to all those that continue to go in and carry the message and will miss the unit whenever the time comes for change. A panel leader is needed for St Mary's meeting and an exact time and date needs to be set. The day for the St Mary's meeting has been set for Tuesdays instead of Saturdays. Ryan D made the suggestion to make a PDF file to give to newcomers with interest in h&i that has name and numbers for panel leaders. Nominations were made for new panel leaders. Nominations are as follows. Nate H, Carrie G, Ed H, Dalmas C.
Cassie C, Nick L, Brian C.
Jason H, Kristin A, Tom F.
Kristen A, Nick C, Eli C, Nate H.
It has come to my attention that not all the reports were e mailed to me or given to me in written form so therefore not all of the reports are included. Very Grateful To Serve, Carrie G.
Greetings from the schedule day coordinator things are going well and schedules are going out to our cabell county contacts this friday November 21st. Thanks to ryan d for going and getting them printed for us. Grateful to serve, Tanner W.
Flyer Day Coordinator position is still up for grabs. The clean time requirement is 90 days and must have willingness to be active in service. Any members with willingness or interest please Ryan D or come to the next PR subcommittee. The last Flyer Day was on 11-15-14, there were 25 members who participated. Ironton, Barboursville, Huntington (east end, downtown, west end), Chesapeake and South Point were targeted. A special thanks to all those that participated and attended. -50 white booklets were delivered to St Marys Psych Unit. - motion to rescind service position for Loved Ones group brought forward by Ryan D, seconded by Tanner W. 6 for 0 against 0 abstaining. Position removed from PR. -Ryan D and Wes R (NaNa) attended and set up PR booth at Job Fair at Western regional on 11-12-14. 63 inmates attended and willingly took NA literature. -New service position (title to be determined) duties will be to print, hold and distribute current meeting schedules to Area, subcommittees, homegroups. Ryan B has willingness, voted for and elected. Motion: To allow area webmaster to immediately add new meeting of existing groups to be added to the meeting schedule without to attend next ASC meeting. All is well at the Hope Without Dope group of Narcotics Anonymous. The doors are open on time, literature is on the table, coffee is hot and the NA message is being carred. We have 40-50 in attendance every Sunday. We have no donation to area this month. Yes on the motion brought by the Hope Turns to Faith group to change language in policy to reflect the need for new meetings to attend one (1) are service committee meeting in order to be added to the schedule. Yes on the motion brought by Trust the Process for the area to add language the area schedule immediately without a wait’ing period. No on the motion brought forth to hold area workshop. The Another Way group is carrying the NA message of recovery. Our attendance is around 12 per week. Coffee is being made, literature is on the table, and the doors are opened on time. We have a new home group member, Kelly, who we would like to welcome. We have a donation to Area of $20. The Monday night “Together We Can” group is doing well. The door is open on time, the rent is paid, literature is made available and the lifesaving message of NA is being shared. Meeting attendance is an average of 35. We have a new homegroup member Tommy R. and tomorrow night we have a homegroup member celebrating one year. At this time no donation to area. All is going well in the Not High Noon meeting. The doors are being opened and the message is being carried. We have a decent supply of literature available and our needs are met, however we do not have a donation to arear at this time. We are holding a function on Dec. 2nd, The Not High Noon Luncheon Function. It is a seasonal theme. There will be a speaker, seasonal treats and a secret santa gift exchange. We have received updated schedules from our newly appointed schedule distributor. Greetings from clean possibilities. All is well the meeting is starting on time, coffee is in the pot, literature is on the table and the lifesaving message of recovery is being carried. Our weekly attendance is around fifteen addicts. We have no donation to area at this time. The meeting is going well. The coffee is hot, literature is on the table and the message of NA is being shared. The meeting is starting and ending on time. 70 to 80 addicts in attendance weekly. We have a $20 donation to area at this time. Grateful to serve, Sean H.
Our meeting is going well. We have four homegroup members. The doors are opening and closing on time. Literature is on the table, coffee is hot and the message of NA is being shared. Average attendance is nine. We could use support from women in the fellowship. Grateful to serve, Sue C.
Everything is well, the doors are open, coffee is made and literature is available. We have an average of $25 to $30 for the 7th tradition. An average of 70-80 in attendance. We do not have any upcoming celebrations. We would like to welcome our new homegroup members: Alan E. and Jessie K. We have a $30 donation to area at this time. We are also voting yes to motion 2 for standing policy subcommittee and yes to motion 3 for the special needs literature. Thank You for letting me be of Service, Davey H.
Greetings my name is Rufus, I am presenting the Wednesday against all odds men’s group. The attendance is anywhere from 10-12 guys joined together to discuss recovery and related issues. We gained 2 new homegroup members. The doors are open on time, coffee is served, literature on the table. Rent is paid. No concerns or donations to area at this time. Grateful to serve, Rufus N.
Greetings from Gods will candlelight group. The doors are open on time, coffee is made and the message is being carried. Average meeting attendance is 40 Literature is on the table. Greetings from the Freedom from Self group, the doors have been opening on time, literature is stocked and the message is being carried. Our average attendance is around 40. This coming week we will be celebrating our one year birthday!! Thanks to area for the support in helping us start our meeting. Good day to my NA family, from the choose to live homegroup. Our meetings are going well, we were closed this past Friday the way 14th as the facility as the facility was being used for a church function. We brought literature and keytags at convention for our group and had a good year celebration on the 7th We do not have a donation to area at this time. Grateful to serve, Ryan D.
Greetings from High on Life the Homegroup has been opened on time every Friday night with coffee made, literature on the tables and a message of hope is being shared. We would like to welcome a new homegroup member Becca and as always we could use more support. Attendance has hovered just above 30 and we have no donation to area at this time. Hey Family, Another Look is moving forward. We are still having meetings Tuesday @7 and Friday @ 6:30. We would appreciate some support for meetings. Group concerns: distribution of literature in public libraries. We would like to ask PR to develop plan to a more cost effective means to fulfil commitment to all libraries in the GTO area. We have a $10 donation to area. In Loving Service, John M.
We are pleased to report meeting is going well. Attendance is growing weekly. Meeting is done by candlelight which presents an atmosphere of peace. A good clear message of Narcotics Anonymous is being shared. We would like to welcome three new homegroup members David H. Jason C. and John M. with a total of six members Yahoo! Rent is paid and literature on the table, no problems to report at this time. In Loving Service, Robbie C.
The meeting is going well. Aug attendance is down to 65. Meetings are running fairly smoothly. The noise issue continues to be tolerable. Our day to day needs are met but we can’t do an area donation this month. We have a motion regarding RCM funding to attend DRSC’s. We have 3-4 new members 2 of them attended the business meeting. Motion: To be reimbursed for 600 schedules/100 flyers and flyer day supplies(receipts attached) Ryan D.
Motion: To provide $75 a piece to the RCM and alternate to attend each RSC meeting. If only one of them can attend only one stipend will be provided. Rationale: the current funding is $120 which likely does not cover their costs, also so that all the funding doesn’t go to one person in the absence of the other.